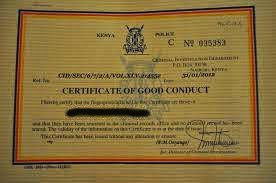 If you live abroad and are unable to travel to Kenya to apply for a Police Certificate of Good Conduct, also known as a Police Clearance Certificate, the following is the procedure. at the time of application. The fingerprints must be taken either by the police or by a notary/lawyer (bearing an official stamp). Photocopied prints or prints used in previous years are not acceptable. If the police authorities in your country of residence question why they need to take your fingerprints, the Kenyan Embassy/High Commission can provide an attestation confirming why they are required. A fee of Kes 1,000 or its equivalent in the country of residence and obtain the official Receipt from the nearest Kenyan mission/embassy or submit a cheque payable to "Director of Criminal Investigation" at Nairobi, Kenya. The application consisting of the original payment receipt/cheque, clear copy of Kenyan Identity Card (or certified copies by competent authorities of both passport and birth certificate where applicable) and fingerprints must be forwarded officially with a covering letter to CID Headquarters-Nairobi through post or runner. Please a list of all Kenyan Embassies and consulates around the world. Take note the certificate can take up to three months to be issued.